"Where this book is exceptional is that the reader will not just learn how LTE works but why it works"
Following on the success of the first edition, this book is fully updated, covering the latest additions to LTE and the key features of LTE-Advanced. This book builds on the success of its predecessor, offering the same comprehensive system-level understanding built on explanations of the underlying theory, now expanded to include complete coverage of Release 9 and the developing specifications for LTE-Advanced. 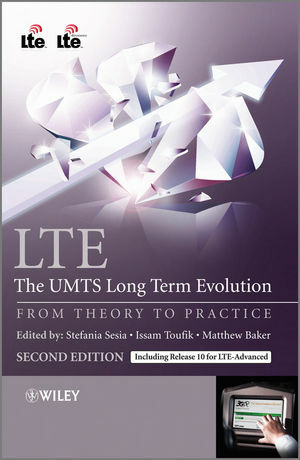 The book is a collaborative effort of more than 40 key experts representing over 20 companies actively participating in the development of LTE, as well as academia. The book highlights practical implications, illustrates the expected performance, and draws comparisons with the well-known WCDMA/HSPA standards. The authors not only pay special attention to the physical layer, giving an insight into the fundamental concepts of OFDMA-FDMA and MIMO, but also cover the higher protocol layers and system architecture to enable the reader to gain an overall understanding of the system. Introduces LTE-Advanced, explaining its context and motivation, as well as the key new features including: carrier aggregation, relaying, high-order MIMO, and Cooperative Multi-Point transmission (CoMP). This book is an invaluable reference for all research and development engineers involved in implementation of LTE or LTE-Advanced, as well as graduate and PhD students in wireless communications. Network operators, service providers and R&D managers will also find this book insightful. Dr Sesia joined Philips/NXP Semiconductor Research and Development center in Sophia Antipolis, France in 2005. She has been participating to 3GPPRAN 4 and RAN 1 standardization meetings and is the author of several international IEEE conference and journal papers, inventor of numerous US and European patents, and contributions to 3GPP. Her research interests are in the field of communication theory and coding theory and well as system level aspects. Dr Toufik is currently a Research and Development Engineer at NXP semiconductors, Sophia Antipolis, France. His current research interests are in the area of digital communications, MIMO-OFDM systems, multiple-access, resource allocation, and implementation aspects of digital communication systems. He is the author of several international IEEE conference and journal papers and inventor of numerous patents related to OFDM-MIMO systems. LTE - The UMTS Long Term Evolution Visit the companion website to access an extensive acronym dictionary to explain all the latest LTE and LTE-advanced terms.